Here's the first big-budget big game surprise of the E3 season: Dying Light, a first-person free-running zombie survival game from Techland, the makers of Dead Island, slated for current and next-gen consoles (and PC) for 2014. Think: Mirror's Edge with the undead. The game was featured last week at a special pre-E3 showcase for select gaming press held by Warner Brothers Interactive Entertainment, publishers of the Batman: Arkham and Scribblenauts games. I was there. I saw the game. It presents really well. Or at least it did—and probably will again. There are two issues with it. But hold those thoughts. The game takes place, as so many do, in a world beset with zombies. It looks like Rio, but they're not specifying. Familiar set-up, novel execution: you play in the first-person perspective through a day-night cycle. By day, you prowl the open-world, scavenging for supplies, going on missions and side-missions, using weapons—I mostly saw melee weapons—in order to fight zombies and other survivors. (There will be guns, too.) But at night, zombies become more powerful and aggressive. You pretty much just run. All of this happens with the added twist that you can do parkour across rooftops. It's a pity WBIE hasn't released video of the game yet, because that's the "wow" element here—the experience of running from zombies across rooftops with the grace and speed not seen since DICE's beloved free-running game Mirror's Edge is the thing that makes it special. At one point, the player came upon some other people who had beat our guy to some supplies. Our guy put his hands up and backed off. The sun began to set and things became more ominous. More zombies seemed to shuffle among the streets. We had to hide. It turns out that our character is himself infected with a zombie virus and that enables him to see the more powerful zombies out there. We spotted one, but it gave chase. This led to the most interesting moment in the demo—one that hopefully wasn't canned, because, if it's dynamic, well, this could be great: the player ran from a crowd of these zombies, looking back with what was presumably the tap of a look-behind button; he got far enough ahead and ran into a building; they missed that and ran past, he ran around them, confounding their stupid zombie brains, defying their deadly flocking, all while in a high-speed run. In theory, you can do all of this in four-player co-op, too. Asked if the developers at the Polish studio Techland were apprehensive about making yet another zombie game, one of the game's developers, Techland brand manager Blazej "Blaze" Krakowiak, said, "That would only be the case if we didn't believe in the originality of the game. I think the day-night cycle, the way the world lives by it—and the complete freedom to explore it based on the free-running—are, I think, defining elements for the game. [They are] not the only important parts, but definitely the parts we used to set it up as something different." The game is being built primarily for the next-gen PlayStation 4 and Xbox One consoles and PC, he added, though it'll be downscaled in some undefined way for PS3 and Xbox 360. It's being created by Techland's original Dead Island team. A different team made the Dead Island sequel Riptide. The other issues, let's be frank, is the developer. Techland is a studio of great ambition and, recently, less great execution. The recent Riptide was ripped as a technological and technical disappointment. The studio, in general, is one of big ideas that don't seem to be consistently delivered. I asked Krakowiak about this, pointing out that others, like me, might be torn between wanting to be optimistic but feeling skeptical about Techland's rep.
"We are definitely learning all the time and changing the processes," he said. "In this case, putting the best people we have on this with the task of making sure this game is the biggest, best game we ever made, because that’s how we look at it. And getting a partner like Warner Bros. Interactive Entertainment—with all the power, capabilities and experience, from consumer research to supporting us on the tech side—this is all geared toward delivering a better game, capital B." I mentioned that the Fallout/Skyrim people at Bethesda had recently had similar problems. They'd been releasing really buggy games and had changed some processes so that they could better deliver games that ran well. I pressed for some clarity on what Techland was changing so that they could deliver something closer to what they promised. "There are stories behind every game we can never discuss publicly, because we’re classy," he said, surely aware that I understood that Techland's recent games have come from other publishers than WBIE. "We don't want to blame any circumstances or anyone or anything because ultimately we are responsible and there's no escaping that. But this is a complicated, multi-million dollar business and not everything always goes perfectly. But we are doing all we can to make Dying Light as great a game as it can be." 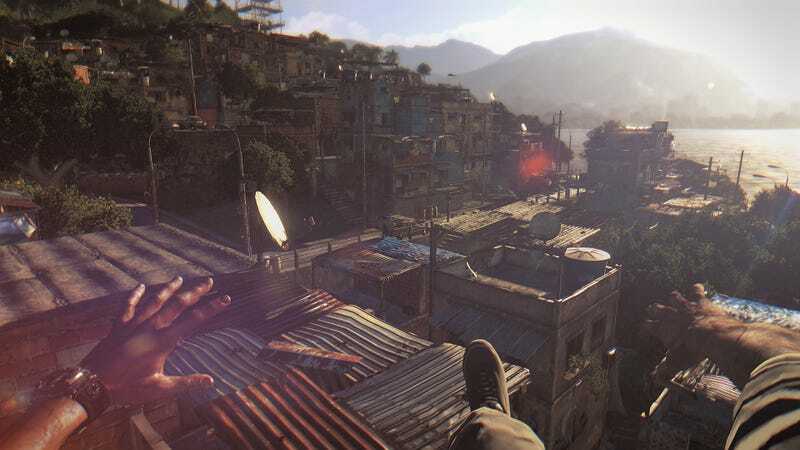 Dying Light is set for a 2014 release. Keep an eye out for video footage. I initially rolled my eyes at the sight of yet another zombie game, but the free-running really does make this game look special.